In 1614, the gentry of the village of Cottingham, some 10 in number at that time, bought the Rights of the Lords of the Manor on a copyhold basis. Copyhold is a way of holding land and property based on manorial records. Copyholders were responsible for the repair and maintenance of their property and had the freedom to sell it if they so wished. These rights could not be infringed by any outsiders, including the Lord of the Manor. The Copyholders had a marked influence in the development of the local communities in Cottingham and Middleton including, in 1854, installation of iron water pipes and pumps to channel the natural spring water prevalent in the villages. The photograph above shows the Cottingham and Middleton Copyholders gathering for their annual dinner in the early 1900s. 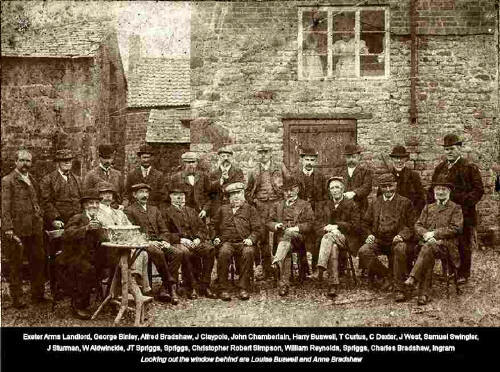 The photo was taken behind the old Exeter Arms pub in Middleton, which half way down Main Street. Well into the 20th century legal documents recorded villagers occupying their homes as 'copyhold or customary tenants of the manor of Cottingham' and, as recently as 1933, it was the custom for the names of all the Copyholders to be called out in the main street, for all to hear! Cottingham still has Copyholders, with the title having been passed down through families, although the title is more honorary nowadays. The Copyholders own 'New Haw' field, which is located at the junction of the A427 and A6003 (see 17th Century map).